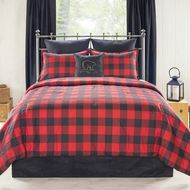 A traditional red and black check buffalo style pattern in red and black. Fabric face is 100% Cotton, filling is Poly Fill. Tailored Bed skirt in Black.